By Keith Cowing on September 30, 2005 4:26 PM. "NASA's top official said today that the future of U.S participation in Russian space flights is in doubt due to a congressional measure that aims to punish Moscow for its cooperation with Iran." Editor's note: Who is advising Griffin on this issue? The last time I checked Congress was looking forward to revising the INA to help NASA. Going to Russia and trying to scare the Russians by pinning all of this on Congress has had one effect: to annoy Congress. This is not the best way to get people to do NASA a favor. "Yesterday, Senate Foreign Relations Committee Chairman Richard G. Lugar (R-Ind.) introduced a bill amending the law to allow both NASA and U.S. corporations to purchase Russian space equipment until 2012." By Keith Cowing on September 30, 2005 4:10 PM. "O'Keefe is not mentioned by name in the report; former and current senior NASA officials told the AP earlier this year he was being investigated personally for potential misuse of government planes and taking too many expensive getaways with his staff." Editor's note: based upon information provided by individuals personally knowledgeable (in the extreme) about the GAO's investigation, this statement is simply not true. O'Keefe is not - nor has he been - "investigated" by GAO. Either AP's Marcia Dunn didn't research this story adequately - or the "former and current NASA officials" she cites have been lying to her - or do not know the facts. By Keith Cowing on September 30, 2005 3:59 PM. Editor's note: Word has it that 350+ employees were laid off at JPL today. Details to follow. By Keith Cowing on September 30, 2005 12:20 PM. "We at NASA have accepted the Government Accountability Office's findings and have embraced new guidelines and procedures for the use of our airplanes that have been set by the Office of Management and Budget. Going forward, all airplane use will be within those guidelines." "Use of NASA passenger aircraft services can save time, provide more flexibility to meet senior executives' schedules, and provide other less tangible and quantifiable benefits. However, GAO's analysis of available reported data related to NASA passenger aircraft services during fiscal years 2003 and 2004 showed NASA reported costs were nearly $25 million compared with estimated commercial airline coach transportation costs of about $5 million.management of this program." By Keith Cowing on September 30, 2005 9:10 AM. "The U.S. space agency NASA has presented to Japan a review plan to reduce the scale of the International Space Station, now under construction, while maintaining Japan's experimental unit for the station, the Japanese science ministry announced Friday." "Well, good question. I think I just said this was not about taking money from the science programs for human space flight and it's not. The science program has not--in our forward planning, we do not take one thin dime out of the science program in order to execute this architecture. It is about re-directing what we do in the human space flight program." By Keith Cowing on September 30, 2005 12:14 AM. "Sen. Hutchison: To accomplish this, the legislation designates the U.S. segment of the International Space Station as national laboratory facility. It further directs the NASA Administrator to develop a plan, within one year after enactment of the bill, to establish a ground-based national laboratory structure that will be responsible for maintaining and operating the research capabilities in the on-orbit laboratory facilities." Continue reading The Senate Speaks Clearly on The Value of a Fully Functional ISS. By Keith Cowing on September 29, 2005 12:46 PM. "Background: Administrator Griffin spoke with USA Today editorial board members and reporters on September 27. He discussed a wide range of issues, including how he believes the space shuttle and international space station should have been developed and run differently. USA Today said Griffin called the shuttle and station "mistakes." By Keith Cowing on September 29, 2005 9:13 AM. "Ohio Republican Sen. Mike DeWine was able to tailor amendments to the NASA Authorization Act of 2005 with the goal of ensuring the center's longevity. The bill, passed on a voice vote, calls for NASA to utilize scientific expertise already in place at Glenn and in Cleveland's medical community." Lunar Science: Where's The Beef? By Keith Cowing on September 29, 2005 1:35 AM. "The current focus on hardware and site selection - engineering rather than science - worries some researchers. "My immediate reaction was: 'So what are they going to do on the Moon? Where's the beef?'" says Wesley Huntress, a former NASA science chief now with the Carnegie Institution of Washington." By Keith Cowing on September 29, 2005 1:13 AM. "NASA Ames Research Center, located in the heart of California's Silicon Valley, and Mountain View-based Google Inc. today announced plans to collaborate on a number of technology-focused research-and-development activities that will couple some of Earth's most powerful technology resources." Editor's earlier note:Instead of waving their arms around trying to grab NASA money that is evaporating, other field centers could do well to study what ARC has accomplished. By Keith Cowing on September 29, 2005 1:04 AM. "Who should attend? Participation is open to all scientists/engineers involved in Mars exploration, including international colleagues. Since this is a 'working' meeting, it is not open to members of the press, however, if there is interest we can make people available for interviews afterwards." Editor's earlier note: Once again NASA seeks to hide discussions about its Mars exploration program behind closed doors. By Keith Cowing on September 28, 2005 6:19 PM. "Asked Tuesday whether the shuttle had been a mistake, Griffin said, "My opinion is that it was. ... It was a design which was extremely aggressive and just barely possible." Asked whether the space station had been a mistake, he said, "Had the decision been mine, we would not have built the space station we're building in the orbit we're building it in." Editor's note: After a day of phone calls and email, I have to say that everyone seems to be shaking their head at this statement. Mike Griffin speaks for the President. The reactions take one (or more) of three directions: Griffin is unable to articulate his ideas clearly; there is a serious disconnect between stated White House policy and its implementation; or the White House no longer (and perhaps never did) care about space. Continue reading Griffin Comes Clean on Shuttle and ISS. By Keith Cowing on September 28, 2005 1:23 PM. "But even some space-related programs are now vulnerable, including divisions that test gravity's effects on living things and others that study how to minimize human error during space flight." By Keith Cowing on September 28, 2005 1:11 PM. "The legislation authorizes NASA for Fiscal Years 2006 through 2010, establishes a policy objective of uninterrupted U.S. spaceflight capability and requires completion of the International Space Station (ISS)." Editor's note: This may be a little hard for Mike Griffin to comply with - he is proposing a 2 year gap between Shuttle shutdown (2010) and CEV operations (2012) - a gap which many expect to widen over time. Moreover, with his plan to limit shuttle ISS missions to between 16 - 18, he will need to gut the baseline (Rev. G) definition (28 flights) of what a "complete" ISS looks like. By Keith Cowing on September 28, 2005 12:12 PM. Continue reading Wayne Hoernig Identified as Rita Victim. By Keith Cowing on September 28, 2005 11:59 AM. "NASA Administrator Michael Griffin today named veteran space shuttle commander Scott J. Horowitz as associate administrator for the Exploration Systems Mission Directorate. Griffin also appointed longtime NASA engineer Doug Cooke as deputy associate administrator for the Exploration Systems Mission Directorate." By Keith Cowing on September 28, 2005 12:58 AM. Editor's note: The following excerpts from internal LaRC Charts show the planning and implementation process for "in-sourcing" - i.e. bringing contractor work in-house to keep civil servants employed. Of course, this means that the contractors who used to do that work will now be laid off. Does China have a VSE too? By Keith Cowing on September 27, 2005 3:22 PM. "China's second manned space mission - and its first to carry two astronauts - is due to launch on Oct. 13, weather permitting, and return five days later, a state media report said." "Rep. Ken Calvert (R-Calif.), chairman of the House Science subcommittee on space and aeronautics, said he fears that China may beat U.S. astronauts back to the moon if NASA's current schedule target of 2018 isn't accelerated. "I've been talking to a number of people that are much more knowledgeable about that than I am, [about] some things that maybe are still classified, but they believe that the Chinese are probably on the mark to get there sooner," Calvert told The DAILY." By Keith Cowing on September 27, 2005 12:08 PM. By Keith Cowing on September 26, 2005 1:53 PM. Editor's Note: NASA/Contractor employee posts relating to JSC evacuation/relocation issues only, please. Off topic comments will not be approved for posting (there may also be a lag time between your posting and the appearance of your post). The information posted here will only be online during the duration of this emergency (as long as is necessary) and will eventually be removed. By Keith Cowing on September 26, 2005 1:51 PM. Editor's update: If you check today's external webcam image you'll see that the greenhouse and HMP base camp was visited once again by what seems to be a mother polar bear and at least one cub. The last visit was on/around 15/16 September. The following images from yesterday and earlier this month show the original tracks - and the new ones - quite clearly. Continue reading Devon Island Update - Polar Bears Return. By Keith Cowing on September 26, 2005 1:29 PM. "If NASA wants to reconnect with the public and enjoy enhanced public and political support, NASA needs to work to bring people along to a new appreciation of what space exploration is really about - but this has to be done with society's viewpoint as a starting point - not NASA's." Editor's note: This story is in response to NASA's Griffin: 'Humans Will Colonize the Solar System' which appeared in Sunday's Washington Post. By Keith Cowing on September 26, 2005 1:25 PM. "This image was taken on September 22, 2005 and received on Earth September 23, 2005. The camera was pointing toward Tethys (and Dione) at approximately 1,495,564 kilometers away." By Keith Cowing on September 25, 2005 5:27 PM. - There were no injuries. - Employees are on admin leave until Tuesday since they may experience problems getting back into the Houston area. By Keith Cowing on September 25, 2005 11:05 AM. "Given these more urgent concerns, cost overruns on a NASA project of dubious scientific value should not be tolerated. If that means delays, so be it. The moon is creeping away from Earth at a rate of only 3.8 centimeters per year; it'll still be around if we can't get there by 2020." "It might be tempting in the current budget environment for members to save money by rejecting NASA's plan. But America ultimately would be poorer for it." Continue reading Newspapers - large and small - weigh in. By Keith Cowing on September 24, 2005 10:49 AM. "About 400 people work in the three offices now, and none of Marshall's 2,400 jobs will be lost, but some employees' work will change, King said. King told employees in a center-wide televised address that NASA and Marshall workers will have to be flexible to support the new space exploration program. "There is a need for folks to move around and maybe do things they haven't done before." By Keith Cowing on September 23, 2005 4:33 PM. Reader Note: "As of yesterday, September 22, some 300 onsite contractors at JPL have received notice. Today is the last day of employment for many of them. Others have been granted 30 day extensions (AKA notice) while displaced JPL employees can be screened for candidates to replace them (the contractors)." By Keith Cowing on September 23, 2005 3:21 PM. "I have decided that it is time for a change. Today, September 23, 2005, is my last day with the Agency." Continue reading John Mankins Departs. By Keith Cowing on September 23, 2005 12:06 PM. "AIAA: "Do you see, in the next year or so as the budget situation gets tighter, any need for reductions in force in the NASA field centers?" Mike Griffin: "Most certainly not. NASA has three main functions, three main mission areas: human spaceflight, science, and aeronautics. Now the Bush administration's Vision for Space Exploration is primarily about altering the direction in which we take human spaceflight; supplementing that, of course, with robotic exploration of the type we already do. So certainly we will not damage a robust space science program, nor will we further cut aeronautics research, in order to fund the human spaceflight program." Editor's note: I am a little confused. If NASA's leader says that there aren't going to be any RIFs, then why are field centers preparing for one? This RIF-related memo from ARC was issued just the other day. So was this one from GRC. Go here. There's more. By Keith Cowing on September 23, 2005 12:01 PM. By Keith Cowing on September 23, 2005 10:16 AM. "It will be announced today that I am returning to Headquarters to assume the role of NASA Chief Engineer." By Keith Cowing on September 23, 2005 10:00 AM. By Keith Cowing on September 22, 2005 10:00 PM. "The Ames Human Resource Division has asked the Office of Personnel Management to provide RIF briefings for civil servant employees. An upcoming large session will be held on October 4, 2005, from 9 - 11 a.m., in the Main Auditorium, Building 201." By Keith Cowing on September 22, 2005 8:39 PM. Center Director Dave King will hold a Marshall Update for employees Friday at 9 a.m. in Morris Auditorium. Continue reading MSFC All Hands Friday. By Keith Cowing on September 22, 2005 4:18 PM. Center Associate Director (Mr. Robert Fails): - Mr. Fails thanked the DLT for supplying their summary of planned contractor losses for the remainder of this fiscal year. Based on inputs received thus far, GRC anticipates losing 340 contractors by the end of FY05. He also is in the process of reviewing the Center's unfunded mandate list." Continue reading GRC RIF Update. By Keith Cowing on September 22, 2005 4:13 PM. "The Museum of Flight has named NASA astronaut Bonnie Dunbar as its new president and CEO." By Keith Cowing on September 22, 2005 4:01 PM. By Keith Cowing on September 22, 2005 2:46 PM. "True, puny mortals also have their say. The United States has now decided to abandon the ISS program. From now on, Russia is the only country that can keep the ISS in orbit." By Keith Cowing on September 22, 2005 2:20 PM. Editor's note: Word has it that ride out team at JSC is now being evacuated. By Keith Cowing on September 22, 2005 12:11 PM. "Two mechanical geologists, Spirit and Opportunity, are doing this even now, by searching for evidence of water on opposite sides of Mars. They don't break for lunch or complain about the cold nights, and they live on sunshine. They've been at it for nearly two years, yet their mission costs less than sending a shuttle to the International Space Station. The brains of Spirit and Opportunity are the brains of geologists back on Earth." ... "Few scientists are calling for a human mission to the Moon or Mars. Human space exploration is essentially over." "And when I hear people point to Spirit and Opportunity and say that these are examples of why we don't need to send humans to Mars, I get very upset. Because that's not even the right discussion to be having. We must send humans to Mars. We can't do it soon enough for me. You know, I'm a robot guy. I mean, I love Spirit and Opportunity - and I use a word like "love" very advisedly when talking about a hunk of metal. Continue reading Deflating Bob Park's Latest Rant. By Keith Cowing on September 22, 2005 11:27 AM. "This next great Era of Exploration will be directed by Baby Boomers, run by Gen X-ers, and its greatest heroes are probably right now sitting in second grade class in Boise, Bangalore and Beijing. The first generation defined itself by its contempt for big organizations, the second by its indifference, and the third thinks Mommy and her laptop go to work at Starbucks." Is OMB Considering Shuttle Termination? By Keith Cowing on September 22, 2005 11:11 AM. Editor's 19 Sep note: David Radzanowski at OMB (Office of Management and Budget) issued an action to NASA at the beginning of September asking the agency to provide him with an estimate of what shutdown costs would result from a termination of the Space Shuttle program in FY 2006. NASA provided a response to OMB on 9 September. Editor's 21 Sep note: Reporters have been calling NASA PAO to get a comment on this NASA Watch posting. PAO's response is something along the lines of "we continue to hold regular meetings with OMB ..." i.e. no confirmation, no denial. Meanwhile, OMB PAO has been calling NASA and asking them what they should say in response to media inquiries and telling reporters to call NASA. Stay tuned. Editor's 22 Sep note: The issue of whether or not to shut down the Shuttle program is still under discussion at the White House. The fact that the issue has not been dropped has a number of people involved rather concerned. "Griffin acknowledged that "we're in a hole" but said it would not be cost-effective to abandon the shuttle because it would "decimate the workforce" needed to build the new spaceship and manage the spaceflight program, as well as "cause a lot of [other] collateral damage" that "wouldn't save much money." By Keith Cowing on September 22, 2005 9:24 AM. Editor's note: S.1713 "A bill to make amendments to the Iran Nonproliferation Act of 2000 related to International Space Station payments", introduced by Sen. Lugar, passed the Senate by unanimous consent yesterday (21 September). The House has yet to take up this legislation. By Keith Cowing on September 22, 2005 12:48 AM. By Keith Cowing on September 21, 2005 1:20 PM. Reader comment: "This is mostly amusing. I like how NASA is efficient in its reuse of official pronouncements. I got this e-mail today:"
Continue reading NASA Improves Education Program Shutdown System. By Keith Cowing on September 21, 2005 12:50 PM. Editor's note: Looking at the media coverage NASA has been getting in response to its recently launched Exploration Systems Architecture Study (ESAS), you'd think no one was in complete command in planning the rollout - other than the computer graphics folks. The message that has now been interpreted - and circulated - by the media is "let's send a few people back to the moon because we can - and do something we did before - and spend 50% of what we need to spend on hurricane damage." The only "why" NASA has offered is "because the President told us to." Continue reading NASA'S ESAS Rollout: Pretty Spaceships Without Social Context. By Keith Cowing on September 21, 2005 11:27 AM. Editor's note: Word has it that astronaut Bonnie Dunbar will be leaving JSC soon and that Christopher Scolese at GSFC has a job promotion in the works. By Keith Cowing on September 21, 2005 11:06 AM. "[House Science Committee Chair] Boehlert says the space agency's current schedule for a return to the moon may have to be adjusted because of budget constraints." "... A contemporary program with a 13-year deadline is precisely the kind of undertaking that can be frittered into nothing if future administrations lose the interest or the revenue to keep pursuing it." -- "... the new proposal is ostensibly part of the Bush administration's grand moon-Mars initiative announced in early 2004. But Mars is not mentioned anywhere in the plans. Nor is the science the crews would perform once they get to the moon." By Keith Cowing on September 21, 2005 8:44 AM. Page 8: "Cancel NASA's New Moon/Mars Initiative - In 2004, the President announced a new initiative to explore the Moon and Mars with the goal of returning humans to the Moon by 2020. NASA currently intends to use the savings from phasing out the space shuttle in 2012 to fund this program. Savings: $44 billion over ten years ($11.5 billion over five years)"
"The list also proposed eliminating the Moon-Mars initiative that NASA announced on Monday ..."
By Keith Cowing on September 20, 2005 1:28 PM. "The President has said not later than 2020 for human lunar return. Our internal planning goal at this point is 2018. Again, that date will be driven by the availability of funds. But if you've heard a rumor that I've asked for extra money for this exploration architecture, that would not be correct." Editor's note: However, NASA has requested billions in additional funds for Shuttle (RTF), ISS, and Hubble from OMB. By Keith Cowing on September 19, 2005 9:06 PM. "Still, NASA seems to be taking a minimalist approach, says Keith Cowing of NASAWatch, a website that tracks the agency's developments. "This is pretty conservative. There are no plans for a big moon base. It's almost like we're trying to prove we can still do it." By Keith Cowing on September 19, 2005 8:15 PM. "NASA's Mars Global Survey orbiter has observed some interesting changes at Mars. Researchers will announce and discuss the discoveries at a listen-and-logon news briefing at 1 p.m. EDT Tuesday, Sept. 20"
Editor's update: A NASA Watch reader came across some odd information on the NASA TV webpage concerning this press event - information which suddenly disappeared. Continue reading Curious Mars News Posting on NASA TV Webpage. By Keith Cowing on September 19, 2005 3:34 PM. "At one point Griffin made a point of saying that science will not be cut in order to fund implementation of the VSE. "It is not about taking money from the science program - or the aeronautics program in order to fund manned space flight. It is about utilizing the money that we have to achieve different - and I think - far more exciting goals - in human spaceflight." He said. A few minutes later he repeated that statement adding that in his plans "we do not take one thin dime" out of science. These statements are in clear conflict with recent events. A hundred or more contractors working on life science activities at ARC have been laid off in past weeks.."
Continue reading Back to the Moon - Sans Life Science. By Marc Boucher on September 19, 2005 12:33 PM. NASA today announced the results of its Exploration Systems Architecture Study. By the end of the next decade astronauts will be back on the moon. The new crew vehicle will be shaped like an Apollo capsule, but it will be three times larger. By Keith Cowing on September 18, 2005 9:15 PM. "I'd say there will be no closing of a field center," Cowing said. "You may have work shifted around some, and work at one center could appear at another center, but no major moves will be made." That also means no major spending will be seen at centers to build facilities not tied to the moon program, Cowing said. 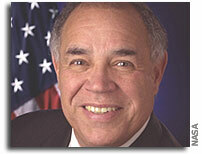 (NASA Administrator) Mike Griffin knows what he wants," Cowing said. "There's not going to be a big call for redundancy in this program. If it doesn't directly support (NASA goals), then I don't think it will happen." By Keith Cowing on September 18, 2005 8:40 PM. Reader note: "Marta Bohn-Meyer, Chief Engineer at the DFRC was killed in a crash in Oklahoma today. She was practicing for the Aeronautical Aerobatics trials upcoming. Husband, Bob Meyers, was also there. He is an Associate Director at DFRC." By Keith Cowing on September 16, 2005 7:28 PM. Editor's update: If you check today's external webcam image you'll see that the greenhouse and HMP base camp was visited by what seems to be a mother polar bear and at least one cub. "The Arthur Clarke Mars Greenhouse was donated by SpaceRef Interactive to the Haughton-Mars Project in 2002. The experiment aims to develop a robust, autonomous greenhouse for growing plants as potential food crops as though it were part of a base on Mars." By Keith Cowing on September 16, 2005 4:40 PM. "After thoughtful deliberation, I have asked the Administrator to allow me to retire in January 2006. I have agreed to stay on as Center Director until a successor is named." Editor's note: The rumor that has been circulating at NASA HQ for the past several days is that both Roy Bridges and Beak Howell will be leaving the agency. By Keith Cowing on September 16, 2005 2:22 PM. "Following a one-hour executive session, Alabama A&M University's Board of Trustees today returned to a packed Clyde Foster Multipurpose Room to hand over the realm of the 130-year-old school to a top NASA center administrator." By Keith Cowing on September 16, 2005 12:56 PM. "Based on the best information we now have, we expect to see a 2 percent to 5 percent reduction in our FY06 budget compared to FY05," JPL director Charles Elachi wrote in a letter to all lab employees. The lab's budget for fiscal year 2005 was $1.6 billion. "The Senate approved a NASA spending bill Thursday that would cut aeronautics research funding by about 5.2 percent next year as Langley Research Center braces for possible layoffs." "[Earls] pointed out that there are cuts across the whole NASA system, but is proud that after he made the case for his center's role in the revamped space program, "I sit here today and tell you that 700 number is now about 145." By Keith Cowing on September 16, 2005 11:33 AM. "Morrell most recently was serving as senior adviser to the administrator, assisting in the development and implementation of policies and activities to support NASA's goals for research and space exploration." By Keith Cowing on September 16, 2005 10:40 AM. Editor's 16 Sep update: The public rollout will be monday at 11:00 am at NASA HQ. "We appreciate your patience over the last few months and would like to offer the opportunity to provide you with a briefing on the ESAS. On Monday, September 19th at 9:00 a.m., NASA will provide a 1 hour briefing on the ESAS results." Editor's 15 Sep update: Various organizations have had all hands meetings at NASA HQ today. The White House has approved NASA's ESAS and it will be unveiled publicly on Monday at NASA HQ. As to what it will look like: think Apollo - both for what it will feature - and what it will not feature - as well as how things will look- and how they will work. Mars is only a footnote - a distant one at that. Continue reading Rollout Plan for Griffin's Architecture Gains Momentum. By Keith Cowing on September 16, 2005 9:28 AM. "Unless Congress or the president acts, no U.S. astronaut will have access to space after the Soyuz flight scheduled to fly to the station on Sept. 30. The shuttle was grounded again after the flight of Discovery resulted in renewed foam-shedding problems." By Keith Cowing on September 15, 2005 11:32 PM. Editor's note: The Senate overwelmingly passed the Departments of Commerce and Justice, Science, and Related Agencies Appropriations Act, 2006 (H.R. 2862) tonight. NASA's portion of this bill amounts to $16.4 billion an increase of $200 million over the previous year's budget. By Keith Cowing on September 15, 2005 10:57 PM. "Due to schedule constraints and cost savings, NASA/GSFC has determined to cancel our plans to issue Request for Proposal (RFP) NNG05121636R for the Propulsion Subsystem for the Lunar Reconnaissance Orbiter (LRO) Project office under the Robotic Lunar Exploration Program." By Keith Cowing on September 15, 2005 10:02 PM. "Today, you are poised to implement a dangerously short-sighted decision. The Agency is on the verge of eliminating most of its Life Science program just as the President has asked NASA to send human explorers deeper into space and thus farther into harm's way." ... "When we contacted a senior HQ manager a few weeks ago about this decision, we were told that the decision was a response to recommendations by the Chief Medical Officer (CMO) and by a Non-Advocate Review (NAR) panel during a zero-base review performed last autumn. We were further told that human health and performance has never been the cause of a spaceflight accident, so this is not deemed a major risk factor." By Keith Cowing on September 15, 2005 7:16 PM. Editor's note: Results from today's PRCB (chaired by John Shannon) include the following decisions: External Tank Processing will be done at Michoud. ET-119 will be off-loaded from the barge and ET-120 will be loaded aboard the barge. The Michoud NDE (Non Destructive Evaluation) team will be ready by 3 Oct. ET-120 will arrive at Michoud on 5 Oct. and NDE will start. The barge will return to KSC and pickup ET-119 and be back at Michoud around 20 October. By Keith Cowing on September 15, 2005 6:37 PM. "Magnificent Desolation: Walking on the Moon 3D takes audiences to the lunar surface to walk alongside the 12 extraordinary astronauts who have been there to experience what they saw, heard, felt, thought and did." Editor's note: I had the chance to catch an advanced media screening of this film today. Longer review to follow. In a word, it is stunning. By Keith Cowing on September 15, 2005 1:57 PM. Editor's note: Today's hot rumor at NASA HQ is that former astronaut Scott Horowitz will be the new ESMD AA. Stay tuned. By Keith Cowing on September 15, 2005 8:21 AM. "If anyone can do it, says Mike Griffin, a former NASA exec and president of the venture-capital firm In-Q-Tel, "Elon can. He has an incredible track record." By Keith Cowing on September 15, 2005 1:34 AM. "During its approach to rendezvous, the visible imager carried by Hayabusa succeeded in taking multi-band filter photographs of Itokawa, as the asteroid rotated. This press release contains the resulting synthesized pseudo-color image and a series of rotation pictures of Itokawa." By Keith Cowing on September 15, 2005 12:49 AM. "With the Elektron O2 generator still off (to be repaired tomorrow), Sergei Krikalev worked on the Russian BMP harmful impurities removal system, starting the "bake-out" cycle to vacuum on absorbent bed #2 of the regenerable dual-channel filtration system. Before sleep time today, the bake-out will be terminated. Channel 1 was regenerated last Monday." By Keith Cowing on September 14, 2005 11:12 AM. "Tuesday, September 20, 2005, 9 a.m. to 5 p.m. and Wednesday, September 21, 2005, 9 a.m. to 5 p.m.; Monday, September 19, 2005, 9 a.m. to 5 p.m.; Wednesday, September 14, 2005, 8:30 a.m. to 5 p.m.; Thursday, September 8, 2005, 9 a.m. to 5 p.m. These meetings will be rescheduled." "I apologize for the quick timeline. It is my goal to present a solid plan to both OMB and Congress as quickly as possible, and I need your help in pulling a plan together that is technically sound. It is very challenging to define a long-term plan that is sufficiently dynamic that it allows for adaptation as we learn new things, and that at the same time defines concrete milestones that are technically meaningful and credible." "As we move forward, a broader national dialog on aeronautics R&D goals may be appropriate as we enter the second century of aviation. These discussions should include a range of stakeholders and customers, including the Congress. This process could lead to a national consensus for aeronautics R&D goals." "The bill requires the President, through the Administrator to develop a national aeronautics policy to guide NASA's aeronautics programs. The report is due with the President's FY 2007 budget request." Editor's note: Gee, Didn't Mike Griffin say that he wanted to come up with an aeronautics plan months ago? Didn't the agency get a heads up from H.R. 3070 that such a plan needed to be developed ASAP? Why is there now such a 'quick timeline' to work on this plan according to Lisa Porter? FY 2007 budget preparation work should now be underway. Wouldn't you want to have that plan in final form so as to guide that work - instead of having the plan being developed in parallel - as is now the case? By Keith Cowing on September 14, 2005 10:53 AM. Reader comment: "Since this summer when my note concerning the possible cutting of the NASA Student Involvement Program was posted on NASA Watch, I was contacted by over 130 teachers who wanted to help. They all agreed to write letters to senators/reps/etc. We heard back from 3 senators who all said they would do what they could to support the program. Sadly, the NASA Student Involvement Program was cut completely." Continue reading NASA Continues to Abandon Education Programs. By Keith Cowing on September 14, 2005 10:47 AM. "KAPL employees were told late last week that the National Aeronautics and Space Administration was ending the $65 million program to develop a nuclear-electric propulsion system as it reorders its priorities." By Keith Cowing on September 14, 2005 1:10 AM. "Hayabusa arrived in the vicinity of asteroid Itokawa on 10:00 am, 12 Sep JST. Hayabusa now hovers around 20 kilometers away from Itokawa. The photo shows the contrast of rocky and hilly regions and a smooth area, which may suggest the origin of this asteroid." By Keith Cowing on September 13, 2005 12:18 PM. "The review will entail an evaluation of human resources (including contractors, detailees, Intergovernmental Personnel Act employees) and funds expenditures to determine whether activities that are performed here can be more effectively undertaken at NASA Field Centers, whether current work activities need to be realigned to conform to Headquarters' corporate roles and responsibilities, and what activities should be revised or eliminated." By Keith Cowing on September 13, 2005 11:33 AM. "Job losses at NASA Langley Research Center are expected to be much lower than originally feared as Congress appears poised to approve additional money for the agency, according to a member of a group that lobbies for the Hampton center." By Keith Cowing on September 13, 2005 11:31 AM. "Jim Kennedy, the director of KSC, confirmed for WESH 2 News Monday the agency's plans to temporarily relocate around 140 workers from that facility." "William "Bill" Parsons, who led NASA's recent Return to Flight mission as shuttle program manager, is returning as director of Stennis Space Center in Hancock County." How many civil servants are there at HQ and the field centers? By Keith Cowing on September 13, 2005 10:50 AM. Editor's note: Have a look at this recent NASA database summary sent to us from someone@nasa.gov. Click on image to enlarge. Continue reading How many civil servants are there at HQ and the field centers?. Just What Job Is NASA Looking to Fill? By Keith Cowing on September 13, 2005 10:09 AM. Editor's note: Have a look at this NASA job opening at jobsearch.usajobs.opm.gov. For starters, there is a typo in the job title: "Reseaarch" Yet when you read the position description itself, it seems that one job opening has collided with another. 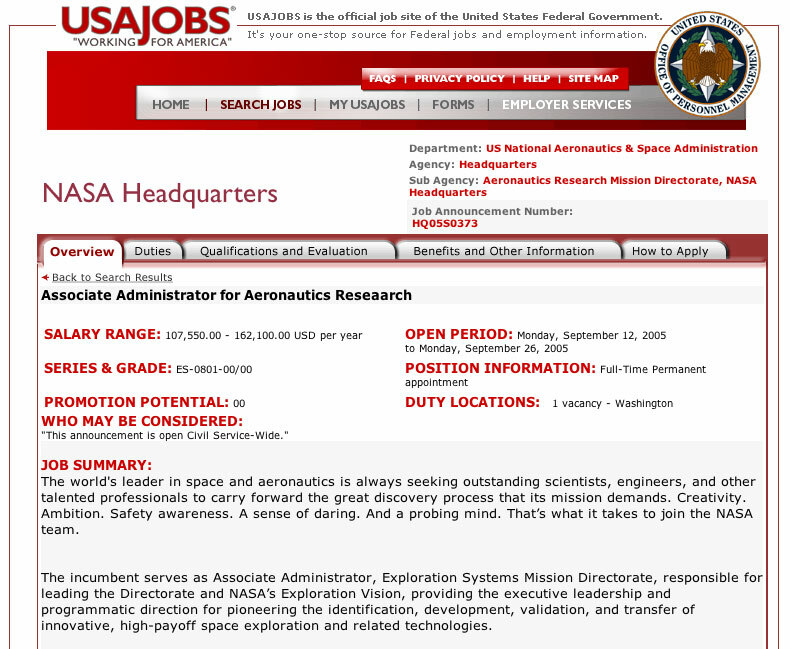 This is supposed to be an aeronautics position - yet the second paragraph in the job summary talks about an exploration position "The incumbent serves as Associate Administrator, Exploration Systems Mission Directorate, responsible for leading the Directorate and NASAs Exploration Vision, providing the executive leadership and programmatic direction for pioneering the identification, development, validation, and transfer of innovative, high-payoff space exploration and related technologies..."
Editor's update: Someone fixed it. This is what was online prior to the correction. By Keith Cowing on September 12, 2005 8:41 PM. "The director of NASA's Glenn Research Center in Cleveland is a finalist to become president of Alabama A&M University. Dr. Julian Manly Earls is one of three candidates, the school said. With final interviews set for Thursday, A&M trustees are expected to name the new university president Friday." By Keith Cowing on September 9, 2005 10:06 PM. "The President intends to nominate Shana L. Dale, of Georgia, to be Deputy Administrator of the National Aeronautics and Space Administration." Editor's earlier note: According to NASA and Congressional sources, Shana Dale will be nominated by President Bush to be the Deputy Administrator of NASA. This announcement is expected very soon. Shana Dale is Chief of Staff of OSTP and is also chair of the Homeland Security Council. Prior to working at OSTP she was staff director of the House Science Committee. By Keith Cowing on September 9, 2005 9:16 PM. "NASA is unable to find about 1,000 workers from the Michoud Assembly Facility east of New Orleans where the space shuttles' external fuel tanks are built. The damage to Michoud and another Gulf Coast NASA center will cost the agency about $1.1 billion as it tries to repair buildings and find homes for those who lost everything when Hurricane Katrina hit Aug. 29, Bill Gerstenmaier, a NASA associate administrator, said Thursday." By Keith Cowing on September 9, 2005 6:05 PM. "The Administration strongly objects to the elimination of funding for key priorities, including the Space Station Cargo/Crew Services and Centennial Challenges programs, and urges the Senate to shift funding from lower-priority programs in the bill to restore the Administration's request." By Keith Cowing on September 9, 2005 2:38 PM. "All civil servants are invited to attend one of the OPM RIF educational briefings in the DEB Auditorium on September 26, 27, or 28, 2005. More information about the sessions will appear soon on Today@Glenn." By Keith Cowing on September 9, 2005 11:44 AM. "NASA's Frederick D. Gregory, who spent 31 years at the agency as a research test pilot, astronaut and senior leader, announced his resignation as deputy administrator today. Gregory will stay in his role until a successor is confirmed by the Senate." Why Buy One Delta/Atlas - When You Can Buy a Half a Dozen Falcons? By Keith Cowing on September 9, 2005 11:10 AM. "SpaceX today announced its new launch vehicle, the Falcon 9, an Evolved Expendable Launch Vehicle (EELV) class vehicle. With up to a 17 ft (5.2 m) diameter fairing, Falcon 9 is capable of launching approximately 21,000 lbs (9,500 kg) to Low Earth Orbit (LEO) in its medium configuration and 55,000 lbs (25,000 kg) to LEO in its heavy configuration, a lift capacity greater than any other launch vehicle. In the medium configuration, Falcon 9 is priced at $27 million per flight with a 12 ft (3.6 m) fairing and $35 million with a 17 ft fairing. Prices include all launch range and third party insurance costs, making Falcon 9 the most cost efficient vehicle in its class worldwide." By Keith Cowing on September 9, 2005 9:59 AM. "Inevitably, I think you can look forward to having fewer people on staff at NASA a year from now than there are today, and I think we just need to face up to that." .... "We want to get corporate G&A in guide with OMB guidelines, reduce the total work force at headquarters back in the direction of a thousand people. It seemed to me and to many others here that it is unconscionable to be worried about having the money and the coverage, work coverage, for 2,000 civil servants out in our field centers while at the same time NASA headquarters has grown from a number something like a thousand to something like 1,600 in the last 3 years or so. That seems unacceptable to me." By Keith Cowing on September 9, 2005 9:40 AM. "The Exploration Life and Medical Sciences (ELMS) Coalition has been formed to actively engage the scientific community in the public policy process. The current central focus is to assure the realization of the national vision to complete and utilize the International Space Station (ISS) for space life sciences research. The second objective is to maintain a robust NASA life sciences program. The third objective is to preserve the NASA Life Sciences community and extramural research." By Keith Cowing on September 9, 2005 12:16 AM. Editor's update: The action being worked is titled "NASA Headquarters Institutional Requirements Review". The abstract of the action, dated 0/02/2005 and coming from Rex Geveden states: "Review is being performed to assess consistency of Headquarters staffing and budgeted resources with the Agency's revised strategic direction. The review will entail a an evaluation of human resources (including contractors, detailees, Intergovernmental Personnel Act employees) and funds expenditures to determine whether activities that are performed here can be more effectively performed at NASA Field Centers." Editor's note: According to NASA HQ sources an action is now circulating, due next Monday, for all the AA's to prioritize their staff. Sources point to a planning target workforce reduction at HQ of 40% that Scott Pace and Mike Griffin have been working toward. This ranking would better help them understand who is important and who is not. Of course, a RIF is the next logical step. Think back to the old RIF Watch days in the 1990's when Dan Goldin wanted to slash the workforce. Remember what "RIF" stood for? Resistance Is Futile. By Keith Cowing on September 9, 2005 12:00 AM. "NOVA AND EDD COMMUNITY SERVICES CAREER TALK - NASA employees and contractors, if you want to find a new job after retirement or resignation, or are facing lay off, the NOVA (North Valley Job Training Consortium) and the EDD (Employment Development Department) organizations may be important community resources for you." By Keith Cowing on September 8, 2005 2:00 PM. Editor's note: NASA HQ management has directed that the ESMD logo no longer be used for official purposes. The NASA meatball logo is to be used instead. Editor's note: Details of the Exploration Systems Mission Directorate (ESMD) reorganization are now circulating at NASA Headquarters. Continue reading ESMD Reorganized, Logo Banned. By Keith Cowing on September 8, 2005 2:07 AM. "Guests were instructed to bring identification to board their buses on launch day; I never saw any being checked. Reporters were warned that their vehicles would be inspected at the space center gate; the trunk of my rental car rarely got more than a cursory peek. Once I was asked, "You got any luggage or anything back there that I need to check?" and was waved on." By Keith Cowing on September 8, 2005 1:52 AM. "A Discussion of the Technical, Programmatic, and Political Factors That Have Lead To Successes and Failures Over the Last Three Decades and Implications for Future Private Sector and Government Facilities"
RTF Part 2 Slipped to Fall 2006? By Keith Cowing on September 7, 2005 9:06 PM. "MSNBC.com has obtained an "extremely preliminary" planning document written by Wayne Hale, NASA's deputy shuttle program manager, in which he concludes: "Launch dates before the fall of 2006 may not be credible." By Keith Cowing on September 7, 2005 9:01 PM. Editor's note: These charts were part of a series of internal presentations made at NASA during June 2005 on the progress of the Exploration Systems Architecture Study. By Keith Cowing on September 7, 2005 6:39 PM. Editor's 31 Aug note: The following internal NASA email is part of the process whereby NASA Headquarters gets its numbers straight before it goes to OMB in early September to ask for an additional $5.5 billion over the next few years (FY 2006-2010) to cover previously unquantified costs. Part of the process is trying to understand where (and how) these costs originated in the first place. Continue reading Kicking Costs Down The Road. By Keith Cowing on September 7, 2005 10:20 AM. Editor's Note: NASA/Contractor employee posts relating to SSC/MAF evacuation/relocation issues only, please. Off topic comments will not be approved for posting (there may also be a lag time between your posting and the appearance of your post). The information posted here will only be online during the duration of this emergency (as long as is necessary) and will eventually be removed. Also, NASA has opened a dedicated toll-free number [877-470-5240] to take information and provide assistance to individuals seeking information about family members that may be sheltering at the Stennis Space Center, Miss., or the Michoud Assembly Facility, near New Orleans. By Keith Cowing on September 7, 2005 10:04 AM. "A NASA spokesman said then that NASA canceled the event because the race "takes considerable resources," including 300 volunteers as well as "a substantial amount of money," about $179,000. After the announcement, Jensen said, NASA heard from teachers who had planned their curricula around the construction of the moonbuggies. "They're working on their buggies now," he said." "A notice on NASA's Great Moonbuggy Race website says it all: "...we must terminate the Great Moonbuggy Race, which we had conducted annually since 1994". Because of shifting priorities and "allocating our human and financial resources to efforts that best contribute to accomplishing our goals", the event that, ever year, inspired students around the country to be innovative in a practical way... is gone." By Keith Cowing on September 7, 2005 1:05 AM. "A South Carolina health official said his colleagues scrambled Tuesday when FEMA gave only a half-hour notice to prepare for the arrival of a plane carrying as many as 180 evacuees to Charleston. But the plane, instead, landed in Charleston, West Virginia, 400 miles away." Editor's note: Is it just me or ... ? By Keith Cowing on September 6, 2005 1:10 PM. Editor's note: This chart was part of a series of internal presentations made at NASA during June 2005 on the progress of the Exploration Systems Architecture Study. Note the substantial decrease in ISS capability that would result if this was actually implemented. "NASA likely will announce that most initial project plans, over which agreements have been made with the Japanese and other governments, will be stopped half-completed. Facilities that will need large supplies and other equipment used for low-priority experiments will be subject to the scaledown, according to the sources. Japan's planned facility also will be targeted for the cutback, the sources added." By Keith Cowing on September 6, 2005 1:08 PM. Editor's note: This chart was part of a series of internal presentations made at NASA during June 2005 on the progress of the Exploration Systems Architecture Study. By Keith Cowing on September 6, 2005 10:18 AM. "This Cooperative Agreement is to create a center of excellence for dexterous robotics technology between GSFC and the recipient to perform: research in dexterous manipulators; dissemination of research results; and public outreach. Researchers in the ISR are all expected to work collaboratively with civil servants at GSFC. The ISR is also expected to become a vehicle to increase the involvement of the university community." ... "The Recipient of this cooperative agreement will establish university and industry partnerships as necessary to provide best-in-class key technologies that are needed to satisfy ISR objectives. The estimated value of this agreement is approximately $45M not to exceed 5 years." Editor's note: At a time when NASA is looking to bring things back in-house - and re-invigorate internal (civil servant) NASA expertise, why is this rather large cooperative agreement being established - one which would use external resources? Think of all the jobs that could be covered by that $45 million. By Keith Cowing on September 6, 2005 9:03 AM. Editor's note: According to an internal NASA memo: "Rex Geveden reported on an Institutional Requirements Review that is starting as a result of the decision at the Strategic Management Council not to approve an over-guide in the Corporate G&A budget. This review process will be outlined in a call letter to be issued on Friday. Rex underscored that it will be requirements driven. We have a target number of "right-sizing" HQ at 1000 people, but this is only a target and can/will be adjusted if the requirements call for more. The activity will focus on near-term decisions needed for FY06, and also consider the longer term process. Continue reading "Rightsizing" - The New Name for Getting Rid of People at NASA. By Keith Cowing on September 6, 2005 7:01 AM. Reader comment: "I don't know if this had already been detected or how newsworthy it is, but as of August 16, all Lockheed Martin employees and subcontractors working on the Astrobiology and Space Research Services Programs and Projects contract with NASA Ames Research Center have been formally notified of the invoking of the WARN act. This came from direction from the NASA contracting officer, reflecting the lack of committed Fiscal Year 2006 funding. Continue reading Life Science Shut Down Update. By Keith Cowing on September 5, 2005 4:40 PM. "MAF (Michoud Assembly Facility), the very place where we needed the most intensive work activity for Return To Flight Part 2, was almost directly in Katrina's path and was hit pretty hard. Lots of damage to facility. Rough estimate is that 60% of workers there lost their homes. Also estimate 4-6 weeks to restore power and water to facility. Since the ET is so key right now, KSC has been asked to ascertain what, if any, ET PAL ramp rework could possibly be done here." Continue reading NASA Hurricane Damage and Assistance Update. By Keith Cowing on September 3, 2005 2:11 PM. Continue reading Internal NASA Hurricane Katrina Recovery Effort. By Keith Cowing on September 3, 2005 9:10 AM. Editor's note: It would seem that Mike Griffin continues to reward senior members of the SES corps at NASA HQ for services provided between 1 July 2004 through 30 June 2005 by downgrading their performance ratings. The performance plans, i.e., the contract with the SES member, had been agreed to, midterm debriefs conducted, final evalutation debriefs accomplished, and 'final' ratings assigned by the personnel review board. These actions were then endorsed by Deputy Administrator Fred Gregory. The downgrading apparently has no correlation with the individuals' previous year's performance plan or the individuals' actual performance (Griffin only "managed" them for 25% of that period). Recently, another senior HQ employee had his NASA Exceptional Service Medal yanked only hours before he was supposed to receive it. If this happens to these folks, it can certainly happen to others elsewhere in the agency. Keep your heads down folks. By Keith Cowing on September 3, 2005 8:07 AM. Editor's note: Go to this image gallery at JSC. Pick an image category - and an image at random. Attached to the image caption will be a caveat that has been in place since the Clinton Adminstration kept a lid on NASA's human exploration yearnings. Often times the caveat is longer than the image caption itself! "Note: NASA currently has no formal plans for a human expedition to Mars or the Moon. This image and others displayed may not reflect the hardware and overall concept of possible visits to either of those celestial bodies. However, the art work represented here serves as a comprehensive study of various concepts and ideas developed as possibilities over a period of years." Now that NASA has the VSE, indeed, as Mike Griffin seeks to accelerate it, why is this silly verbiage still on line? It would seem to be sending exactly the opposite message than NASA is implementing. By Keith Cowing on September 2, 2005 12:53 AM. Editor's note: Informed sources report FEMA has commandeered all NASA aircraft, disrupting agency efforts to reach employees at SSC. By Keith Cowing on September 1, 2005 4:30 PM. "Changes to the Iran Nonproliferation Act to allow NASA to buy Russian space goods and services could see legislative action starting next week." By Keith Cowing on September 1, 2005 1:40 PM. "Working atop a range of Martian hills, NASA's Spirit rover is rewarding researchers with tempting scenes filled with evidence of past planet environments. "When the images came down and we could see horizon all the way around, that was every bit as exhilarating as getting to the top of any mountain I've climbed on Earth," said Chris Leger, a rover planner at NASA's Jet Propulsion Laboratory (JPL), Pasadena, Calif."
By Keith Cowing on September 1, 2005 11:35 AM. "NASA/MSFC intends to contract with CSC for the proposed effort on a sole-source basis by awarding a modification to the current purchase order to add this work, which has an estimated period of performance by three months (October 01, 2005, through December 31, 2005)."